You have questions, and we have answers. Check out the FAQs below for lots of information about Cherry Tree Inn & Suites. If you don’t find your answers, make sure to contact us and we’ll get back with you as soon as possible. For reservations in May through October, we require 24-hours notice prior to your date of arrival to cancel with no penalty. November through April, you can cancel reservations up to the day of arrival by 6 p.m.
To cancel or modify your reservation, call our 24-hour Front Desk team at 231-938-8888. Check in begins at 3 p.m., and you can check out any time before 11 a.m.
We have an indoor and an outdoor pool. The outdoor pool is seasonal with a year-round hot tub, and the indoor pool, spa, and dry sauna are open 24 hours a day. Yes, we have a 24-hour indoor hot tub and a year-round outdoor hot tub with daily hours of operation. Many of our rooms have two-person Jacuzzis as well. Yes. All rooms come with free Wi-Fi, and we also offer free Wi-Fi throughout the property, including our pools and beach areas. Do you have any specials or packages? Yes, check them out here. We also have great rewards programs for leisure and corporate travelers. Yes, and, in addition, guests can enjoy water sports from our beach, 100 miles of hiking trails throughout the region, including The Sleeping Bear Dunes national park, and even winter sports like downhill skiing, cross-country skiing, tubing, and snowmobiling nearby. While we love animals, we do not offer pet-friendly accommodations. We can direct you to a couple of local kennels our team members use and trust for their own furry family members. Yes, our business center comes with computer, printer, and 24-hour secretarial services. Onsite laundry room and dry-cleaning service is available. No, we don’t, but we’re happy to direct you to a great variety of restaurants that deliver to the hotel on demand. Yes, we can set you up with connecting rooms. Call our Front Desk at (231) 938-8888 to check availability for your reservations. With 25 room types available, we have varying limits to the people in each room. Generally, our rooms accommodate four to five people. Call the Front Desk to confirm the number of people in your room prior to your arrival so we can advise you specifically for your room type. Does the hotel have ADA wheelchair-accessible rooms? Yes, we have four different room types to select from. Yes, each building has an elevator for your convenience. Do the rooms have stoves? Yes, our Lake Michigan Studios, Harbor Springs Suites, Lake Charlevoix Studio, Petoskey Studio, Suttons Bay Suite, Sleeping Bear Dunes Suite, and East Bay Suite all offer expanded kitchenettes with two-burner cooktops. Our Cherry Tree Family Suite offers a full range with a four-burner cook top. Yes, you can request a rollaway bed for $10 per night. 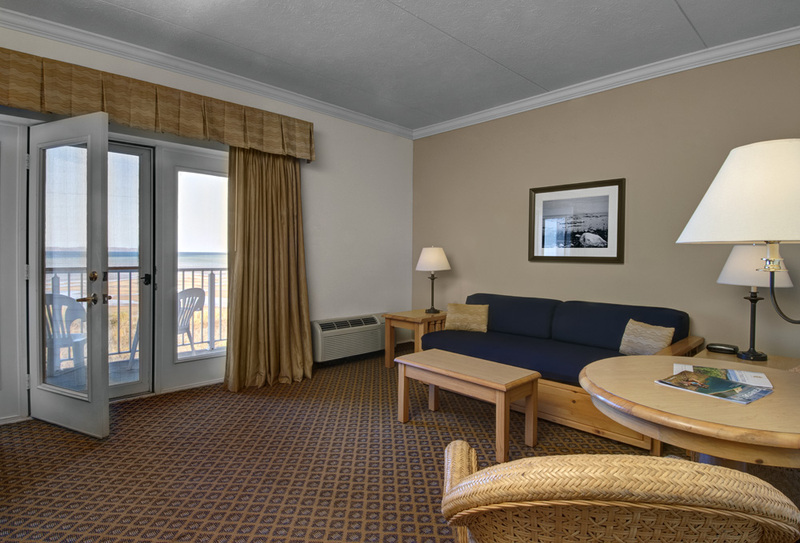 Call our Front Desk at (231) 938-8888 to check availability for your reservations. We are located in the “Beach District” of Traverse City. We boast 400 feet of waterfront access, and our hotel is near casinos, breweries, wineries, and the Sleeping Bear Dunes National Lakeshore. Do you offer free shuttle services? Yes, we offer free shuttle service to downtown Traverse City, Turtle Creek Casino, and Cherry Capital Airport. Do you have on-site parking? What is the price of parking? Yes, we offer free on-site parking for our guests. What airports are nearby? How far is the hotel from the airport? We are about a 10-minute drive from Cherry Capital Airport. What is the weather like in Traverse City? Traverse City has warm, mild summers, and during the fall, the days are warm and the nights are cool. Some years, the water is warm enough for swimming through September. In the winter, snowfall occurs any time between November and April. What are nearby attractions and things to do? There are tons of fun and exciting things to do close to our hotel. Plan your trip with this handy area guide. Can I rent water equipment? Yes, Blue Sky Rentals operates right off our beach. Check out their offerings by clicking here. We’re happy to help you get a quote. Fill out this request form or contact Kristin Toedebusch for more details. How many people can your meeting and event spaces accommodate? We can accommodate up to 50 people depending on your setup needs. Do you offer group accommodations or group room blocks? Yes, we provide group accommodations and room blocks for your party. Fill out this request form or contact Kristin Toedebusch for more details. Depending on the time of the year, we do offer group discounts. Does the hotel have a restaurant and/or bar? No, but you can satisfy your sweet tooth at Sandy’s Sweet Shoppe. Let the locals show you their favorite spots. Check out some of our favorites here. Do you serve breakfast? What is the price? We serve complimentary hot breakfast to our guests from 6 a.m. to 10 a.m. Monday through Friday and 7 a.m. to 10 a.m. Saturday and Sunday.